The OFT has postponed its decision on Amazon's proposed acquisition of The Book Depository until 2nd September. I presume that means the decision has not been straightforward. 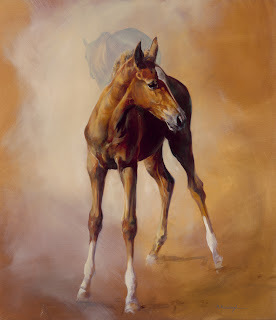 One of the artists exhibiting at the Society of Equestrian Artists' exhibition in Nottingham from 18th September is Hannah Merson. Hannah's my guest blogger today, talking about trying to doing something that is certainly less complicated to do when you don't have children. I've never been particularly maternal. Even as a little girl I shunned dolls in favour of farms and all the exciting things that came with them like tractors, cows and horses. So, it was with some surprise in 2004 when I was working as a Senior Finance Manager for the Alliance & Leicester banking group that I fell pregnant with my son Thomas. I wouldn't have a proper horse obsession if the horse in art didn't also make me ridiculously excited. 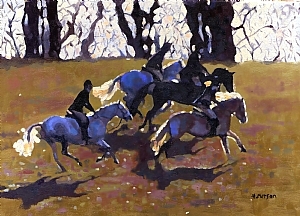 Just up the railway line from me in Nottinghamshire is the Sally Mitchell Gallery, which will be putting on the East Midlands Open Exhibition of Equestrian Art, in conjunction with the Society of Equestrian Artists. The SEA is a charity that "promotes the best in contemporary equestrian art and supports and encourages artists who share that passion." Their website is very well worth a look. I have a Christmas present list filled up for years now. I've just bought another set of vintage Pony magazines, which has an article on a perennial favourite of mine, the dressing up class. Alas the quality of the photographs is pretty basic so it's not always easy to tell what's going on. I think a better photograph would have done justice to the splendour of Miss Middleton's Panshanger Riding School doing A Midsummer Night's Dream. But to no avail, as the fox got there first, in the Bucknall family's Fox's Frolic. Linda Newbery, Carnegie Medal nominee for The Shell House, Sisterland,At the Firefly Gate, silver medal winner, Nestlé Children's Book Prize for Catcall, and Costa Children’s Book winner of 2006 for Set in Stone, is today's guest blogger. Linda was a fan of the Romney Marsh and Punchbowl Farm books of Monica Edwards, and this piece, which first appeared in The Martello Magazine in 2007, explains why. I can say without doubt that Monica Edwards made me want to be a writer from an early age. I've put off getting new hens for months; mainly because neither of us could face the thought of more months trying to prevent our Black Rocks, who are the Al Capones of the hen world, making determined efforts to keep the hen population at what they considered an acceptable level: them, and their hench hen. Last time we got new hens it took months of keeping the hens separately, Black Rocks patrolling the dividing fence like sharks hoping for seals, before peace finally broke out. It's not as if our hens lack space. Here is the hen area at Badger Towers, all surrounded by electric fence. 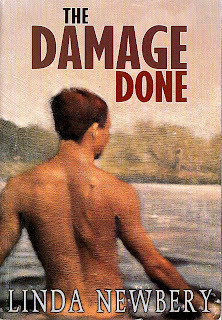 I usually review books which are in print, as there's not a great deal of point going completely overboard about something brilliant but so gallopingly obscure and out of print it is obtainable only for a small mortgage and the gleaming locks of your first born child. These two books have made me make an exception. A while back I reviewed Linda Newbery's Barney the Boat Dog, and the author got in touch with me suggesting another couple of her books she thought I might like. She was right. Thanks to Hannah Fleetwood for this. this pony will do instead. Unless the Apocalypse intervenes, of course. Thanks to boing-boing for the first, and Susanna Forrest for the second. And apologies for repeating myself if you follow me on Twitter. 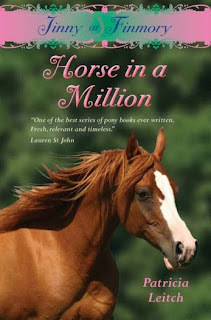 I'm delighted to welcome my latest guest blogger, editor of PONY Magazine, and author of the Pony Whisperer series, Janet Rising. Car journey boredom is not something from which I suffer, for there are always horses to see! 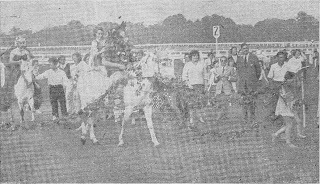 As a young child, even before I swapped a shilling for I-SpyHorses &Ponies, my head would swivel from right to left on any car journey. I was, and still am, an equine-seeking missile. 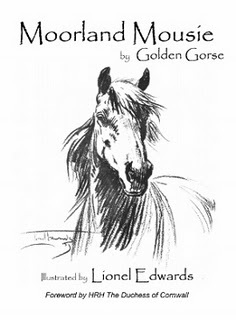 The Moorland Mousie Trust has re-released Golden Gorse's Moorland Mousie: the quintessential Exmoor pony book, and one of the forerunners of the modern day pony book. The book is, I am delighted to say, is hardback, oh joy. 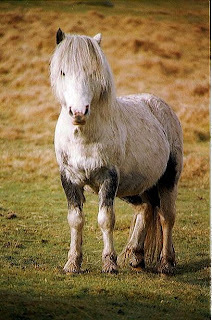 So, not only can you support the endangered Exmoor pony, you can support the survival of what looks like an endangered book form too. The book contains all the original Lionel Edwards illustrations, and the Trust have tried to stick to the original in format and style as closely as possible. A few weeks ago Catnip's commisioning editor wrote a piece on why she commisioned the reprints.